I admit that I just flat out adore lemons. From taking the smelliness off your hands after preparing your fish dishes, to kicking them up a notch after you've cooked them and put them on a plate, you have to agree, that if nothing else, these yellow and green (lime) little beauties are versatile. So imagine how happy I was to stumble across Lékué's Luki Lemon Press, a worthy, and I must say, formidable competitor to the average, everyday Lemon Squeezer. Or, by simply using a little human hand and finger action to get the juices flowing. 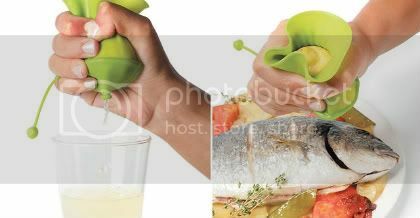 But by inserting a half of a lemon into this neat little gadget, you can squeeze the juice out of a bottom spout -- without seeds. The design also includes a snap-shut spout for storage of your partially-squeezed lemon in the refrigerator. $8.95 for a set of two at amazon.com What a gadget. Love this one! A boon to those who have small cuts in their hands (not only is it more sanitary, but the juice will no longer hurt).